You are here: Home / Weekly Columns / Opinion / Top 5 Most Notoriously Negative Portrayals Of Black People In Video Games. Top 5 Most Notoriously Negative Portrayals Of Black People In Video Games. 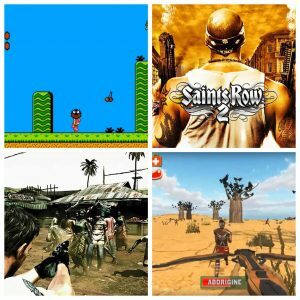 (ThyBlackMan.com) I previously wrote an article talking about my love/hate relationship of how black people are portrayed in video games. Despite that, I am an avid gamer and I’ve been one since I remember playing my first video game when I was just 8 years old. The video game industry like the movie and TV industry also has a notorious history of perpetuating negative stereotypes about black people and it still happens to this day. These big gaming developers often play their role in helping perpetuate those negative stereotypes about black people by creating black characters that portray those negative stereotypes based on the negative images that they get from the colonial media. The video game industry is a massive multibillion dollar industry where most of its net profit nowadays comes from hot mobile games like Clash Royale and Fornite. Here are top 5 of the most notoriously negative portrayals of black people in video games. 1. Resident Evil 5 – I remember watching a gameplay video of this game in an African stage and I immediately became disgusted with the distorted negative portrayal of Africa as being a “poverty, famine stricken, war torn country” and African people in that game were portrayed as mindless zombies and savages that the white male character in Chris Redfield had to shoot which further added to my dislike for the game in general. 2. Yume Kojo: Doki Doki Panic – Back in the late 1980s, the Japanese game developers got the idea for Super Mario Bros. 2 which some people nowadays refer to as a “glorified hack” of Doki Doki Panic. The main controversy surrounding this game was when blackface was used in certain stages of the game to knock enemies off the screen, but thankfully this was edited in the western version of the game called Super Mario Bros. 2 due to the controversy of blackface’s historical disrespect and mockery towards black people. 3. Survival Island 3 – White nationalist gaming developers had created a game called “Survival Island 3” for The Google Play Store where players get rewarded for glorifying the historical colonial violence and genocide against the black Aboriginals in Australia by getting weapons and food in exchange for killing as many black Aboriginals that were negatively portrayed as “game to hunt.” This game was so controversial that a petition was started that called for the game to be removed from The Google Play Store after concerns from other gamers about the glorification of colonial violence against black people, especially against the black Aboriginals in Australia. 4. Saints Row – I remember playing this game back in the day and I was immediately appalled and disgusted at the barrage of negative stereotypes of black people that I found in the game: gangsters, thugs, trappers (drug dealers), hookers, and exotic dancers. There was not one positive image of a black person in that game at all. 5. Final Fantasy VII – Final Fantasy is actually been one of my favorite RPG series, but the one Final Fantasy that I was offended by and one of the most controversial moments in FF history was the negative portrayal of its very first black character in Final Fantasy VII in the form of Barret Wallace because he was given the most negative stereotypes out of all the characters in the game by Japanese gaming developers. In this game, he’s negatively portrayed as “angry & violent” as well as his appearance being deliberately designed to make him look more like a criminal or a thug which is very reflective of the colonial media’s negative distorted portrayal of black men. That is the main reason why Final Fantasy VII is my least favorite Final Fantasy game. The Conclusion – One way to understand media is to also understand how negative portrayals of black people from colonial media not only influence policy, but also criminalization, incarceration, and video games.